Day +57: Kiira is still doing well. Today she let me do her central line bandage change at home for the first time. 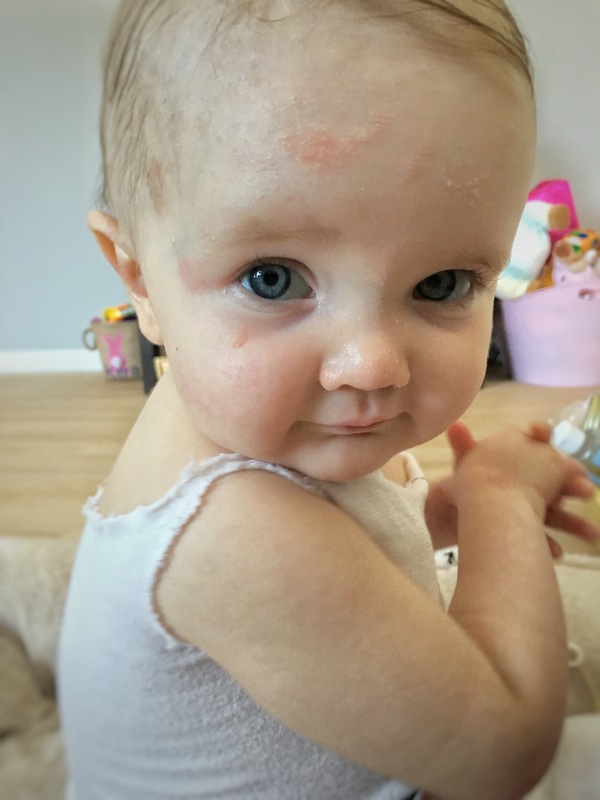 Remembering how awful they were to do when we first got here, I’m so relieved it doesn’t tear her skin or cause her pain anymore, which made me feel comfortable enough to do it at home rather than have the nurses do it. After all the bandages were done (her skin still looks great), she let me do a little photo shoot of her. And in case she doesn’t wear enough bandages, she wanted to wear her toy bandaid on her arm too. We still have her engraftment test on Monday and should find out results late next week. Please pray that Miia’s cells are still dominating in Kiira’s body. Thank you! Day +54: It’s hard to believe we are over half way done with our journey in Minnesota, as long as all continues to go well. CMV levels are now way down (from 2200 to 180), so all we have to do is a maintenance treatment of 1 antiviral IV a day for 6 weeks. All other levels of blood cell counts and electrolytes are stable, so now we only go into clinic once a week. Kiira has had a couple little blisters/skin tears, but so minimal compared to what we saw before BMT. I am so thankful for her recovery thus far. God has answered so many of our prayers in the way we hoped and we continue to pray for total healing so she can lead a long, healthy life. Next Monday we do an engraftment test to see if Kiira still has 100 and 99% of Miia’s cells. We pray that she does! 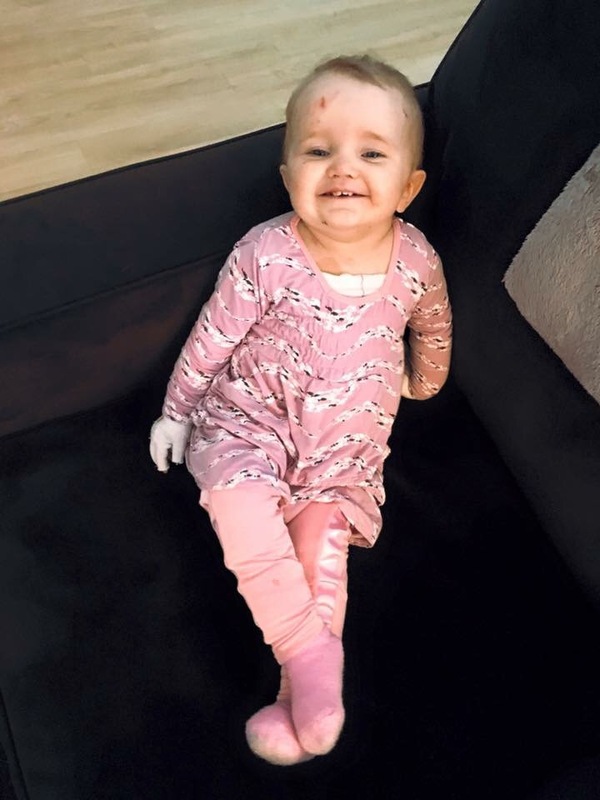 Later next week, she gets a boost of Miia’s donor cells, a built-in part of the protocol this time around, which will help her to keep Miia’s cells. The rest of this week, we’ll enjoy time at our Minnesota home with my aunt and uncle who are visiting. Thank you for your prayers, because they’re working! Day +49: Yesterday I posted the picture of Kiira without bandages in the midst of me changing them and her skin is looking great! 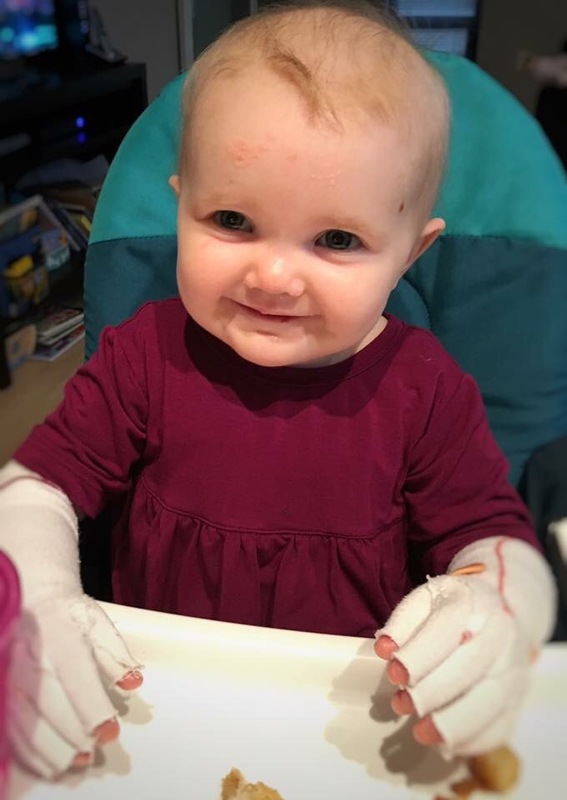 I hope someday that she can go without bandages for more than a few minutes at a time, but for now, I still bandage everything as before the BMT to keep her skin protected. I don’t really have an update about the guy who is in the hospital, but I know he is still struggling and one of many in the hospital due to the toll of EB. Awhile ago I also posted about a little boy with EB in an orphanage who needed his forever home. I’m so happy that a friend in the EB community is adopting him. He isn’t doing well and she needs to get to him as soon as possible. If you have the means, please consider donating to help fund his adoption. http://reecesrainbow.org/109644/sponsortravis. Thank you for the prayers and support for Kiira. Other kids aren’t so fortunate and I’d like to share the love with them tonight. 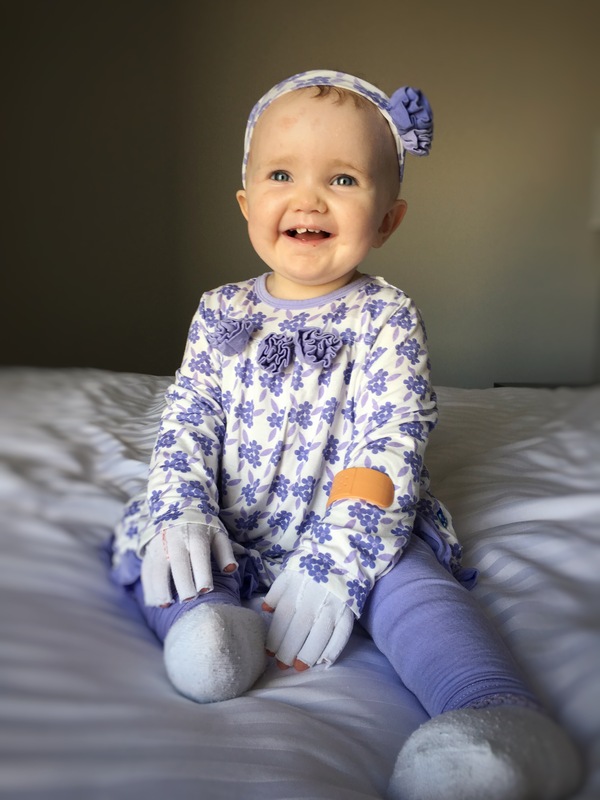 Day +48: We had Kiira’s checkup yesterday and everything is looking good, so we’re just staying the course on treatment of CMV and recovering from the BMT. Her skin still looks really good too. However, tonight my heart is heavy. A sweet baby boy, Nate Tough, passed away last week as he was getting ready to start the BMT process. He had junctional herlitz EB. Another, one of the “older” people (31) with RDEB, is alone and fighting for his life in the hospital. I hate EB for so many reasons. Yes it is a very physically painful and debilitating condition that takes lives too early, but it also leaves a wake of destruction among families, other relationships, mental health, financial stability, and every aspect of life you can think of. I’m thankful Kiira is doing well for now, but until EB is cured, no one who has EB or knows someone with EB, will go unscathed. Please keep these families in your prayers and pray for a cure. Day +44: Thank you all for your prayers, because they worked! Kiira’s CMV level dropped from 2200 to 600! Yay–no hospital at this point! Also her IgG level is good so Kiira doesn’t need an infusion on Monday. So I’ll take this weekend to be thankful for our freedom from the hospital and for Kiira’s improved health. Thank you also to those who have sent cards or packages. It’s really nice to see the love and support you all have for Kiira and our family. We are beyond grateful for all of your thoughts and prayers! Day +43: There isn’t much new to tell, but Kiira’s CMV numbers are still going up, despite staying on the IV anti-viral medication twice a day. 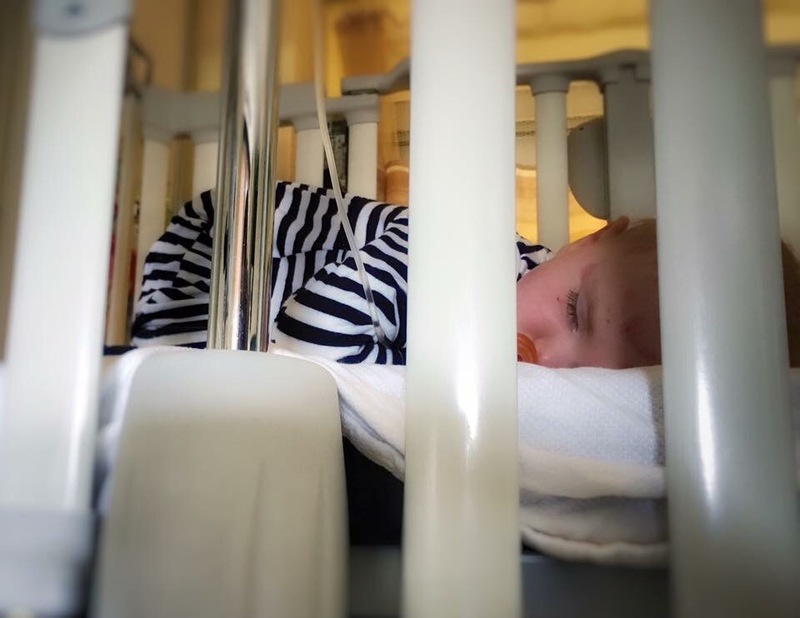 If today’s level increases even more, which I’ll find out late tomorrow, Kiira will be readmitted to hospital this weekend for a minimum of 48 hours to get her electrolytes stabilized as she starts a new, more intense treatment. She will be hooked up to an IV nearly all day, between the 4 IV meds I need to give her, but I know it’s temporary, and I’d rather fight off CMV quickly than let it take Kiira down. Let’s just pray her CMV level starts going down! Day +39: Things are going well for Kiira for the most part. We had to add another IV infusion each day to supply her with magnesium, but we made a little backpack for her to carry it around in and she is actually proud of it, so it’s not a big deal. 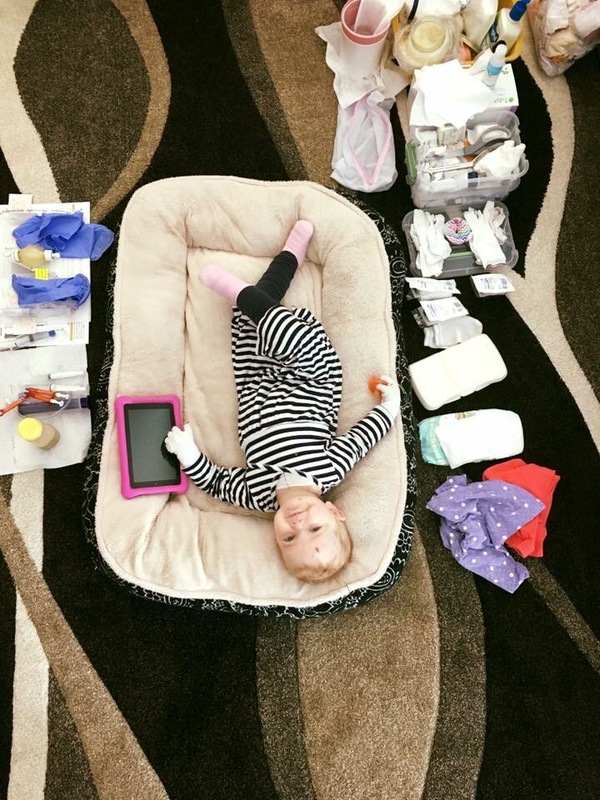 Her WBC, hemoglobin, platelets and other electrolyte levels are good, but CMV decided to make a comeback and it’s at an all-time high. We took another level on Friday and I’m praying its down or we might be readmitted to the hospital this week. Kiira and I keep busy, often taking long walks around Minneapolis. 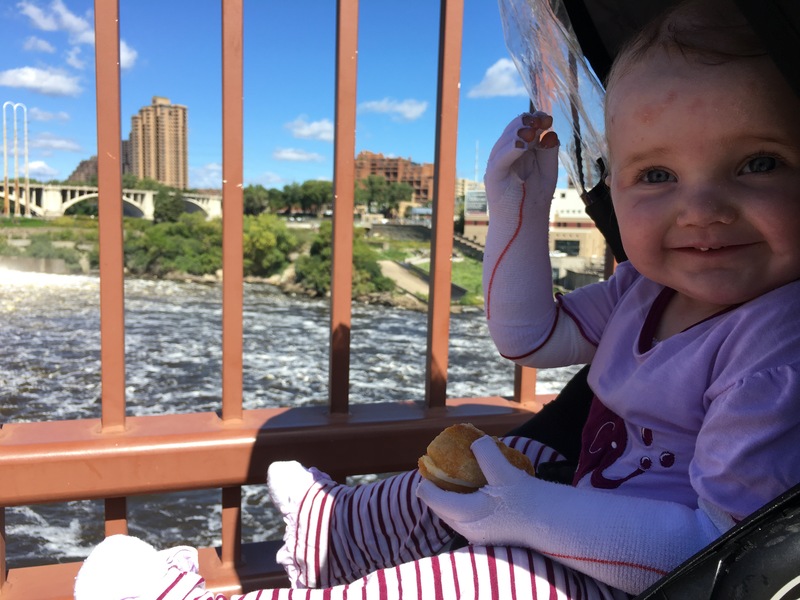 Usually she is covered in her stroller, but I pulled it up to snap a picture of her by the Mississippi River. She loves getting out and asks to go for a walk every day and she is content to sit there for hours, taking in her surroundings. She has certainly learned patience through her journey. 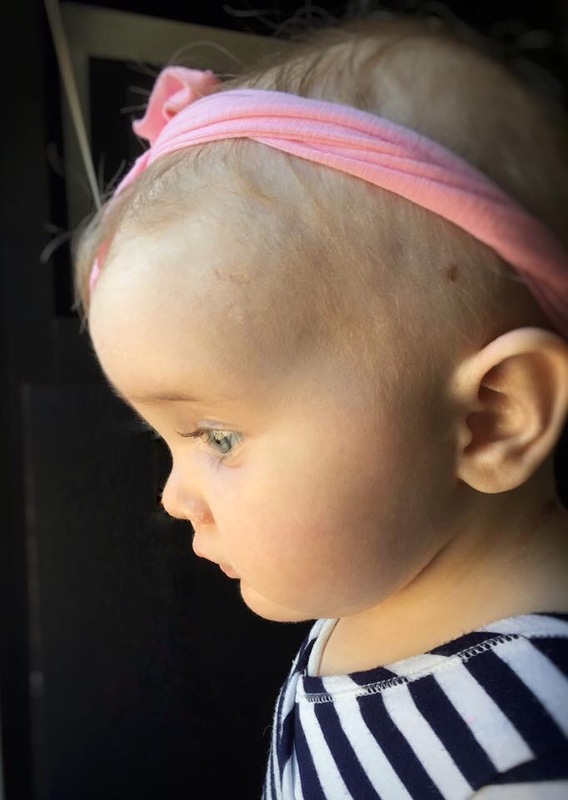 Tomorrow she will be 23 months old, and yet her positive attitude, thankful heart, observing mind, and patience surpasses mine by leaps and bounds. We are so thankful for your prayers. We know they are keeping Kiira strong! Day +34: Kiira is doing well: her white blood cell and hemoglobin counts are slowly going up on their own. Her blood pressure has stabilized so we took her off BP meds and the CMV (virus) counts are going down, which is what we want. We will continue to give her IV meds twice a day for another week and if it keeps going down, we can go to once a day for the next 4-6 weeks. Her skin is looking great, except for her booty because of tummy issues and the back of her head, where it rubs on the side of the pack n play. I’m trying to resolve both issues, since they’re painful for her, but we can’t complain too much because I’ve never seen her hands and feet look so good. I so thankful for your prayers and am hopeful these are long-term results. Day +29: We got Kiira’s engraftment numbers today: 100% cd3 and 99% cd33, which means she almost completely has Miia’s immune system! Yay!! Numbers may still fluctuate but this is great for now. We are still treating CMV and I’m currently doing the IV meds at home. 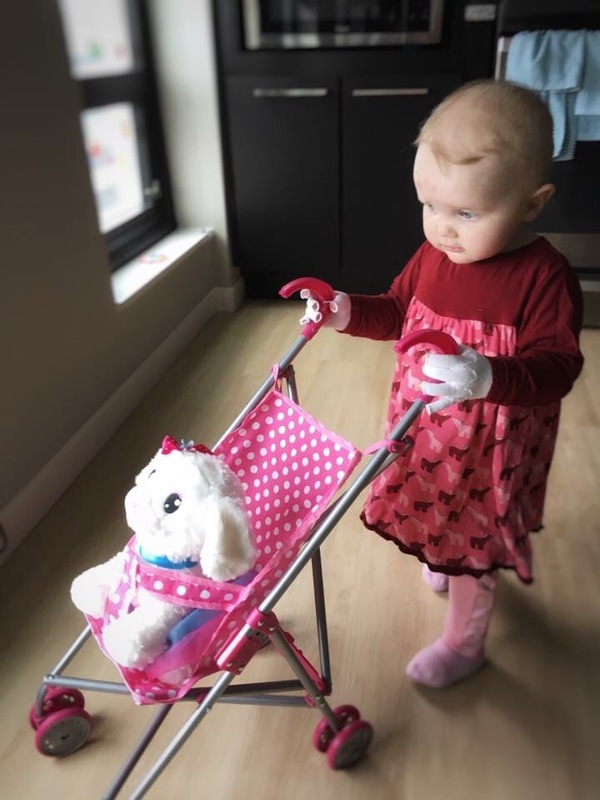 Unfortunately it’s like chemo, so it will keep Kiira’s immune system lower for the 6-8 week treatment (have to be even more careful with exposure) and I have to be very careful with handling, like wear gloves to change diapers and throw meds in a special container. CMV can also lower the immune system and the virus and/or treatment can cause graft failure. 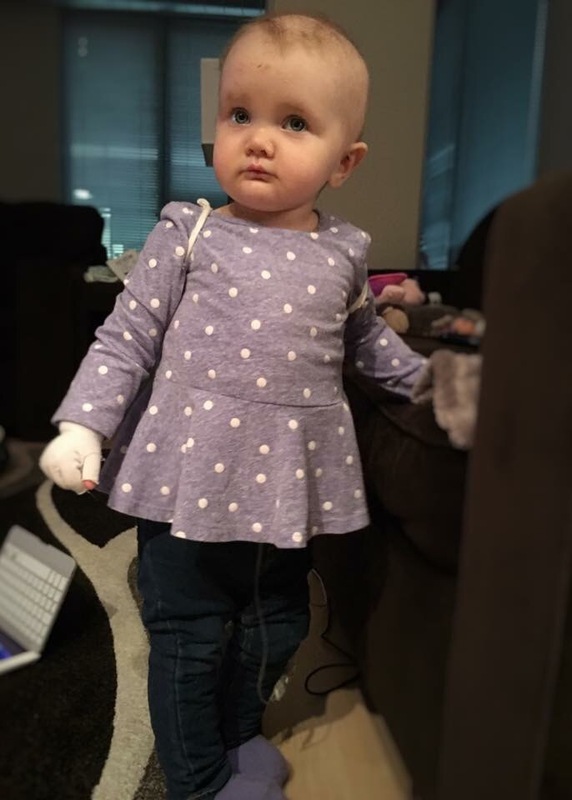 Since Kiira’s WBC count dropped more today, the doctors are really weighing options about whether or not to send Kiira inpatient for a different treatment that’s easier on the immune system, harder on the kidneys, but a stronger drug to combat CMV. CMV is treatable but I am nervous about it affecting engraftment. The doctor and I discussed the balance of waiting too long to treat it more aggressively to save engraftment versus just waiting and seeing what her body does on her own with the current IV meds. They are looking closely at her counts and checking CMV levels every couple of days and hopefully we’ll make the best educated decision. Today we had an IVIG infusion, putting us in the clinic for over 4 hours. Tomorrow we have another appointment and possibly a dose of GCSF to stimulate Kiira’s immune system. I’m confident in the team here and they celebrated Kiira’s engraftment numbers as much as I did, so she is in good hands. Thank you for your prayers!